The 2019 Cadillac XT4 is late to the game. 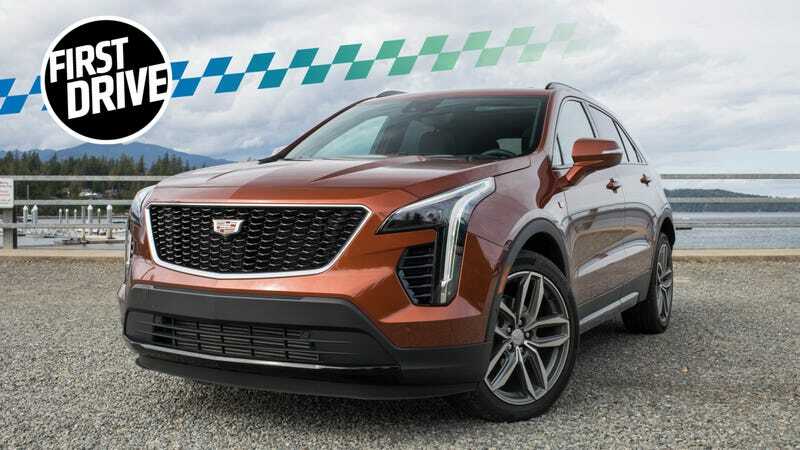 It is only Cadillac’s third crossover entry on Day 6,419 of the SUV/crossover onslaught and comes at a time when probably most of Cadillac’s competitors are far ahead in the Big Cars race. So it’s got some catching up to do. Fortunately, it’s a luxury crossover with an all-new engine and an all-new platform. And the XT4 is priced aggressively: Starting at $34,795, it’s cheaper than a comparable BMW, but a hair more expensive than a Mercedes or Volvo. Why is this a car that buyers should concern themselves with, other than the fact that it’s another crossover? Well, it’s billed as being designed for fun, but the actual driving experience never quite lives up to that. During a presentation at the car’s media launch in Seattle, Cadillac’s engineers spoke at length about how the brand-new chassis has been stiffened for greater driver engagement and road feedback. It even has a lateral cross brace. The XT4 is its own car; it doesn’t ride on a platform merely recycled from another GM product. It even has an all-new engine for Cadillac too. This is the car that Cadillac undoubtedly hopes will print money, the one that will help build its sales both here and in China, which is currently its top market. It’s not just the chassis that’s new, either. The XT4 also uses a brand-new, 2.0-liter turbocharged four-cylinder engine, good for 237 horsepower and 258 lb-ft of torque. That torque is apparently available from 1,500 rpm to 4,000 rpm, which makes it extremely usable. It’s mated to a nine-speed automatic, which I was told has “imperceptible shifts” that have been optimized for maximum vehicle efficiency. Cadillac says that it will always find the right gear for the right moment. And the car has an eco mode that will deactivate two of its cylinders while driving to save even more fuel. There’s also a new electro-hydraulic braking system, which reduces the parasitic demands of the brakes on the engine and lessens inconsistencies in braking and pedal feel over an extended period of time. Cadillac didn’t provide us with any zero to 60 times or top speeds, but all of this new technology for a car that starts under $35,000 was impressive. I didn’t think that little engine could be peppy at all, but it certainly was. When passing and merging, the automatic kicked down pretty quickly into the appropriate gear and the car leaped forward to close the gap. It’s not earth-shattering acceleration, but it gets the job done well. Around some tight bends, the XT4's height wasn’t the most confidence-inspiring, but it still handled the decently. It was comfortable to sit in for the four hours that I spent with it, and also came with Cadillac’s digital rear-view camera, handy for expanding rear-view visibility as the C-pillars are large. Rear passenger room was also impressive. My driving partner, who is 6'1" (I am not) moved the driver’s seat to his driving position and then climbed into the back row. His knees touched the front seat, but overall he said he was comfortable and could ride that way for a decent amount of time. But if you were to put a car seat back there, the kids’ feet would definitely touch the front seats. The only different between the two upper trim packages, the Sport and the Premium Luxury, are a few design cues and a suspension option. The Sport rides on a much more athletic-feeling suspension setup, whereas the Luxury feels noticeably bouncier. The interior materials were nice to the touch, with a satisfying amount of buttons and switches. The only off-putting thing was the big, droopy slab of dashboard hanging out from the right of the infotainment screen. What is that? It seems like wasted space. I felt my eyebrows raise when the Cadillac people said that the XT4 had nine gears. Nine gears is far too many for an engine with that little power, I reasoned. And I was right. But it’s that subjective kind of “right,” the kind that acknowledges that the gearbox is doing its job of shifting and saving gas, but is also bummed out that the transmission isn’t more pleasant to experience. If Cadillac set out to make those shifts seem “imperceptible,” then it sure pulled that off. There’s barely a hiccup in the car’s acceleration as it upshifts. Mash on the accelerator and the transmission drops by a few gears to dip into the power, but the ratios are so short that it leaps back up through the gears in almost a frenzied staccato. We thought putting it in manual mode would help. It didn’t. The car revolted against any instruction from the dinky little paddle shifters behind the wheel, changing gear far too slowly. Chastised, we put it back into automatic mode. Why even bother giving it a manual option, then? Despite being a “compact” crossover, the XT4 isn’t a small car. Nor does it feel that way. Yes, work went into tightening up the chassis, but all that effort seemed lost because the steering is so loose and vague. It felt unconnected from the road and I had trouble figuring out where the front of the car was pointed in the very tight turns. But for navigating Costco parking lots, it should be just fine. That’s probably what most buyers are going to be using it for. The base model XT4, as mentioned above, will cost $34,795. But the ones I was driving in Seattle were the Sport and Premium Luxury trims. After options like the all-wheel drive, comfort and convenience package, power sunroof, and 20-inch wheels, the total vehicle price came to $56,835. Which is a lot more! Don’t get me wrong, the XT4 is a nice car, but nothing about it blew me away. Except maybe the base price. But I wonder how many of these cars you can actually buy at the dealership will be that low. Even though the little engine has a little kick to it and the chassis underwent all kinds of stiffening here and there, any attitude the car could have is hidden away in its numb steering and the short ratios of the nine-speed. Will this platform underpin other Cadillac models? (It has to.) Will it be shared across other GM cars? (Maybe.) What else is getting that engine? (Probably a lot of stuff.) A Cadillac spokesperson declined to answer any of those questions, however. Cadillac reminded us at this launch that a barrage of new Cadillacs is coming. A new model will be launched every six months through 2020, starting with the XT4. Which almost certainly means more compact crossovers because Cadillac’s got to stay competitive. Its current sedan-heavy lineup isn’t doing it any favors, but hopefully this move to crossovers isn’t too little, too late. 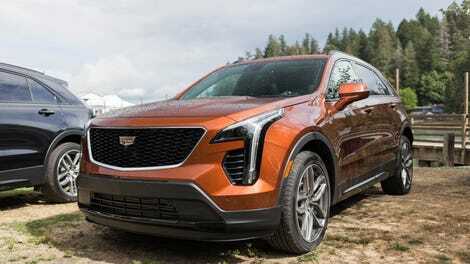 I got the sense, after listening to the presentation Cadillac gave about its car, that it resigned the XT4 to be something between fulfilling that crossover demand and also being a car that isn’t complete vehicular anesthesia to drive. Like it’s being aimed at someone who doesn’t actually want a crossover but has to buy one because, like, kids and everything. If that’s the case, then what about a V-Sport or V model? The Cadillac spokesperson declined to comment on that as well. As it stands, the XT4 is solidly Fine. You don’t need to teach yourself anything new when you climb into it in order to drive it. It does what it’s supposed to do without complaint. You buy it and drive it don’t think about it again because it will give you exactly zero trouble, but also zero joy. When I reviewed my first draft of this story, I noticed I called it the “XT$” by mistake in one section. But that typo’s appropriate. If things go well, the XT4 should be a money machine. But it won’t thrill any drivers while it does that. Update 11:05 a.m. EST: Cadillac provided us with the XT4's performance specs. The FWD will do zero to 60 in seven seconds, the AWD in 7.2 seconds. And the top speed is a tire-limited 130 mph.